Prior to Friday night’s match-up with the Portland Trail Blazers at Staples Center, Los Angeles Clippers head coach Doc Rivers fielded questions about the eventual return of all-star forward Blake Griffin to the Clippers starting line-up. Griffin’s been out since partially tearing his left quadricep tendon in a Christmas Day win over the Los Angeles Lakers. Griffin was expected back sooner until he added fractured right hand a month later punching a Clippers assistant equipment manager outside of a Toronto restaurant. Since first being sidelined, the Clippers have posted an impressive 26 and 14 record without Griffin. That’s great for a bench that’s gotten extended playing time because of the adjustments being made without Griffin. The team’s efficiency on both sides of the ball without Griffin has it in the top ten in the league based on 100 possessions per game. The Clippers rank seventh in the league in offensive efficiency scoring 108 points per game, fifth in the league in defensive efficiency holding opponents to 102.2 points per game. That puts the Clippers at an impressive fifth overall in the league at plus 5.8 points per game versus the rest of the league. Including Friday’s game with the Trail Blazers, the Clippers have 12 regular season games remaining and are, at this point, locked in as the fourth overall seed in the Western Conference with home court advantage in the first round of the playoffs basically assured. So, when is Griffin coming back? The hand is healed so the quad is still what’s keeping him out. He still has to sit out a four game suspension handed down by the league for the altercation in Toronto which means if he’s to get some playing time to get acclimated to the team and vice versa before the playoffs, it seems imperative he gets back in the lineup in the next ten days. Rivers answers questions involving Blake’s health and imminent return in the video provided which also shows Griffin working out prior to the Portland game with one of Doc’s assistants, Dave Severns. 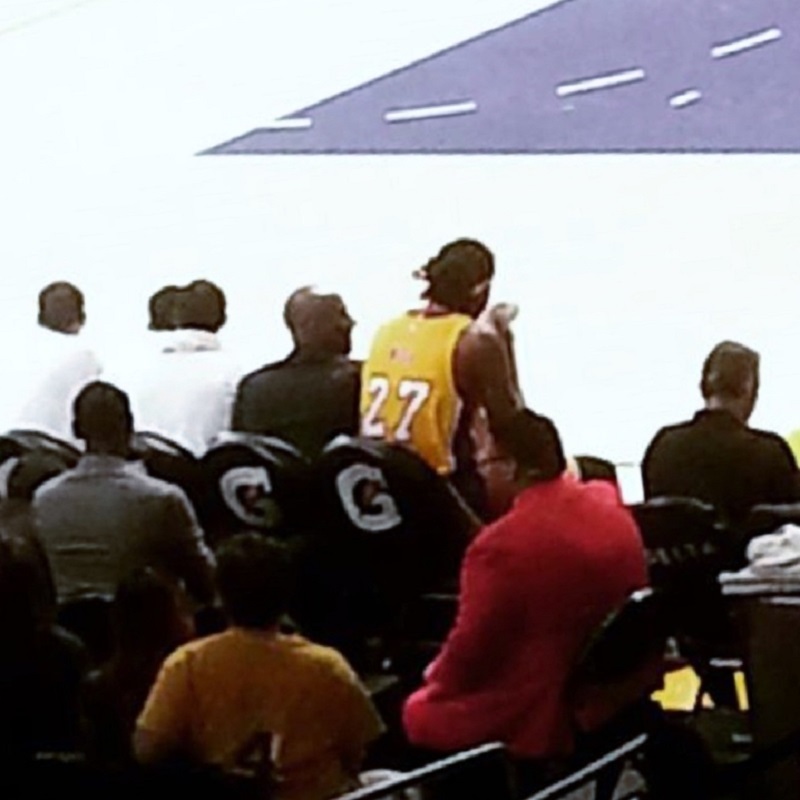 Kobe Bryant can do nothing but watch from the bench in street clothes as the Lakers fall to the Jazz, 80-73. Know questioning the Lakers’ collective hearts. Every player goes hard every night for head coach Byron Scott. However, unlike the legendary teams throughout the franchise’s history, these Lakers just don’t have the star-power, at the moment, to win close games down the stretch. Leading 69-68 with just under six minutes left in the fourth quarter, the Lakers were outscored by Utah, 12 to four, and lost to the Jazz, 80-73. Utah held the Lakers to just 39 percent shooting from the field for the game. The Jazz (31-37) were led by Gordon Hayward who registered a game-high 22 points. Reserve Trey Burke added 17, Derrick Favors had 14 and was huge on the defensive end making a key block late in the game rejecting Ed Davis right at the rim and Trevor Booker chipped in with 10. For the Lakers, Tarik Black registered his third career double-double and secnd as a Laker with 13 points and 10 rebounds. Wesley Johnson had 12 points and Carlos Boozer added 11. This was L.A.’s ninth loss in its last 10 games and fourth consecutive defeat. The Lakers (17-50) now have the fourth worst record in the league with 15 games remaining and at this rate are a lock to keep their first round draft pick in this June’s draft. The Lakers are back on the Staple Center floor Sunday when they host one of the three teams they’re chasing for worst record in the Association; the Philadelphia 76ers. The Los Angeles Lakers play host to the Utah Jazz Thursday at Staples Center. Prior to the game, Lakers coach Byron Scott met with the media to discuss the Jazz. L.A. went into Salt lake City last month and beat Utah, 100-97. Scott also talks about some sort of hair line feud with injured guard Nick Young . 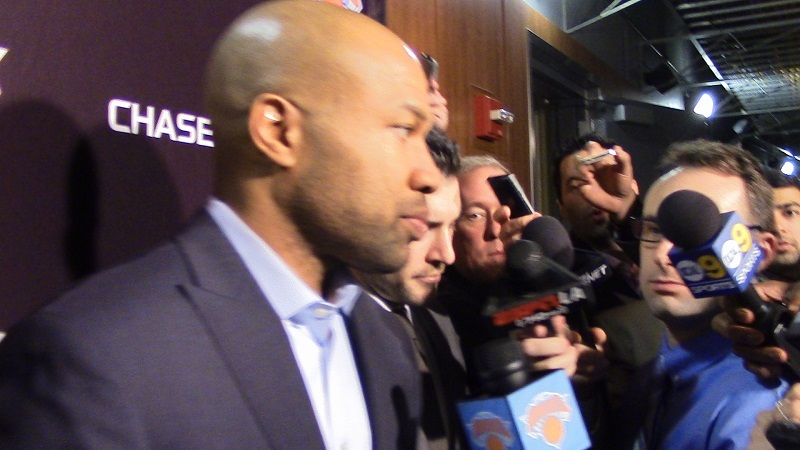 Knicks head coach Derek Fisher meets the L.A. media upon his return to face the Lakers. New York Knicks (12-51) vs. Los Angeles Lakers (17-46) was once a marquee NBA match-up. These two franchises played for the championship in three out of four years in the early seventies with the New Yorkers taking two of the three meetings garnering the Knicks their only two titles in franchise history. For the time being, not so much. What was once the household names of Jerry West vs. Walt Frazier and Wilt Chamberlain vs. Willis Reed has digressed to the not so household names of Jeremy Lin vs. Tim Hardaway Jr. and Jordan Hill vs. Andrea Bargnani. Factor in both teams’ leading scorers and perennial all-stars Kobe Bryant and Carmelo Anthony are out with season-ending injuries, Thursday’s game figures to have more of a Summer League match-up rather than a clash of two of the league’s storied franchises. A little nostalgia from the benches is more what people are looking forward to when the lottery-bound teams meet Thursday at Staples Center in Los Angeles. Knicks rookie head coach Derek Fisher returns to face a Lakers team he helped win five titles as a player. Assisting Fisher is Kurt Rambis who teamed up with Lakers coach Byron Scott during the Showtime Era helping the Lakers wn three of their five titles in the 80s. And of course there is Knicks first year president and ex-Lakers head coach Phil Jackson who still happens to be Lakers co-owner Jeanie Buss’ man. Jackson guided the Lakers to five titles in this new millennium. So much more drama seems to be off the court than on it for both teams which makes this match-up so intriguing. The Knicks – losers of five straight – have the worst record in the league while the Lakers – who snapped a five game losing streak of their own beating Detroit Tuesday at Staples Center – own the leagues fourth worst record. Although this east coast-west coast rivalry isn’t what it used to be, it can return to what it once was with both teams getting healthy through the draft and free agency. Something both teams are banking on. To hear from Derek Fisher and Byron Scott, click on the video with this story. Sports fans in Los Angeles have been spoiled listening to the play-by-play voices of the teams – both college and pro – that have called the City of Angels home. Among the elite voices are the Dodgers’ Vin Scully, Bob Miller of the Kings and the late Chick Hearn of the Lakers. The legendary voice of the Los Angeles Clippers, Ralph Lawler, is in that conversation as well of course. Currently in his 36th season calling Clippers games, he was honored with Lawler Night at Staples Center for Monday’s game between the Clippers and Minnesota Timberwolves. Catch words or phrases like “Bingo!” after a three-point bucket and “Oh me, Oh my!” are what Clipper Nation have recognized all these years – good and bad. Scully, Miller, former Clippers players Gary Grant, Lamond Murray and Pooh Richardson among others were in the building to pay tribute to Lawler. All fans going to the game received a special “Oh Me, Oh My” t-shirt. At halftime L.A. City Council President Herb J. Wesson presented a proclamation officially making March 9th “Ralph Lawler Day” in Los Angeles. Lawler’s won three local Emmy’s for his announcing and has called 2.838 Clipper games (and still going) making him the third longest tenured broadcaster in the NBA. 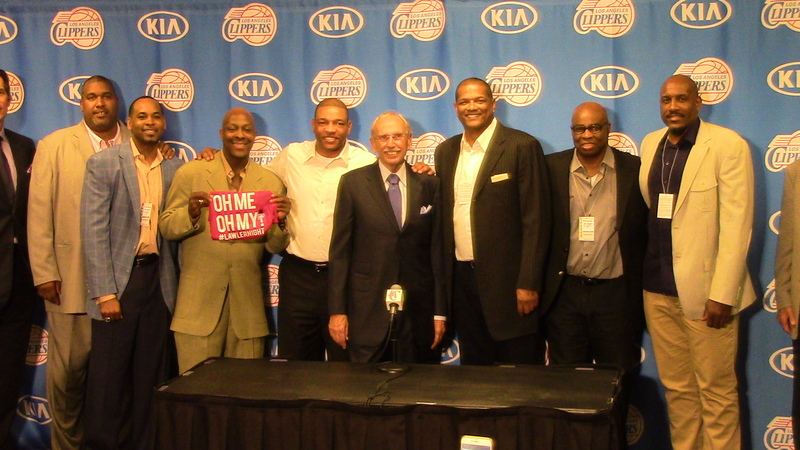 To hear from Lawler and some current and former Clippers, click on the video with this story. New Orleans Pelicans forward Anthony Davis will miss this Sunday’s NBA All-Star Game at Madison Square Garden in New York because of a right shoulder sprain that’s kept him of the line-up in New Orleans’ last two games. You’d think Los Angeles Clippers center DeAndre Jordan would get a call from the commissioner’s office as Davis’ replacement but that call never came. Instead, Dallas Mavericks forward Dirk Nowitzki got the call to replace Davis on the West roster. The Jordan snub obviously didn’t come unnoticed by his Clippers teammates and head coach Doc Rivers. They understand offense sells and defense doesn’t especially in the all-star game where it’s non-existent. In his seventh season with the Clippers, Jordan has been putting up all-star numbers as, easily, the best defender in the league averaging double-figures in rebounds and scoring with his points coming off rebound opportunities and five block shots per contest. 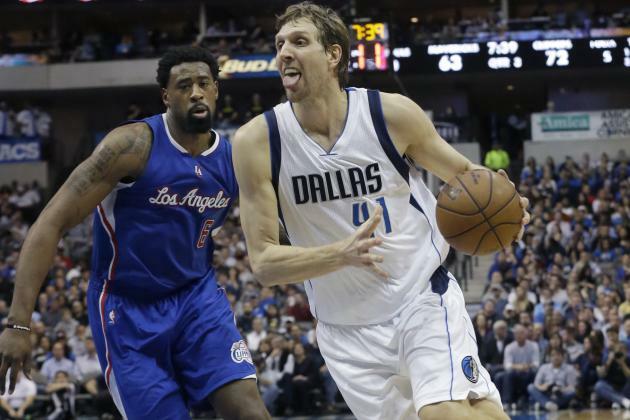 Clippers DeAndre Jordan (left) was snubbed for the West All-Star Team in favor of Dallas’ Dirk Nowitzki (right). What they do know is if the Clippers have a legitimate shot at winning an NBA title as soon as this season, Jordan’s defense and rebounding will be a big reason why. To hear more from the Clippers on Jordan’s all-star snub, watch the video accompanying this story. This will be Nowitzki’s 13 all-star game appearance in his 17th season in the league. He won’t replace Davis in the West’s starting line-up. Golden State rookie head coach Steve Kerr will pick Davis’ replacement as the starter on the front line. 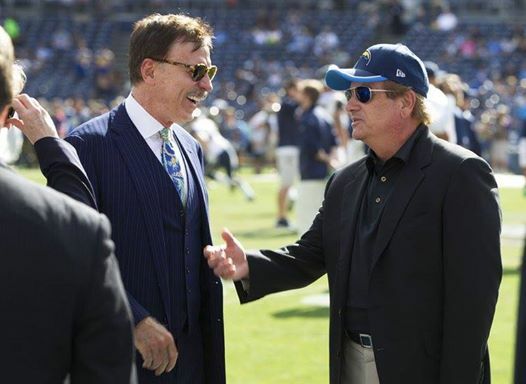 Rams owner Stan Kroenke (left) is building an 80,000 seat stadium in Inglewood. Since the Rams and Raiders left Los Angeles in 1995, 22 of the 32 NFL teams have moved into new stadiums with all of them built at Los Angeles’ expense. That includes the Edward Jones Dome in St. Louis where the Rams moved after the 1994 season. The cost to the City of Angels is the privilege of being the home of a franchise in the biggest and most lucrative entertainment/sports industry: the National Football League. Los Angeles – the second largest media market in the country also known as the Entertainment Capital of the World – has always been considered an NFL market. For the last two decades L.A.’s game has been off the field being used as leverage by the owners threatening a move to the City of Angels in the process fleecing their current cities of taxpayer dollars to build these new multi-billion dollar stadiums. This has enabled the value of all 32 franchises to climb to an average of $1.4 billion apiece. That’s a total of $44.8 billion. The Indanapolis Colts – who parked their team plane at LAX – are one of many teams using L.A. as leverage to get a stadium deal in their current city. That “L.A. Leverage Game” for the league is a thing of the past with all these new cathedrals of the gridiron up and running. The St. Louis Rams, Oakland Raiders and San Diego Chargers are the three remaining teams needing new buildings. The Raiders and Chargers leveraging their respective cities with L.A. can’t work because the cities they call home and L.A. are all California cities and are thus subjected to the exact same laws. It’s absolutely known that all government entities in the Golden State will not earmark taxpayer dollars towards sports stadiums. It’s just no fiscally responsible. For L.A. to get back on the field a stadium needs to be privately funded. 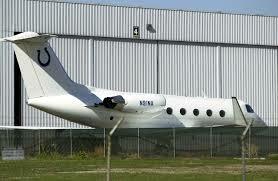 Enter Rams owner Stan Kroenke. He’s partnered with the Stockbridge Group in Inglewood and is going to build an 80,000 seat stadium where the old Hollywood Park Race Track sits on his own dime. Plans are for it to be done in time for the 2018 season with the Coliseum or Rose Bowl a temporary home for a team – or teams – moving to L.A. in the meantime. 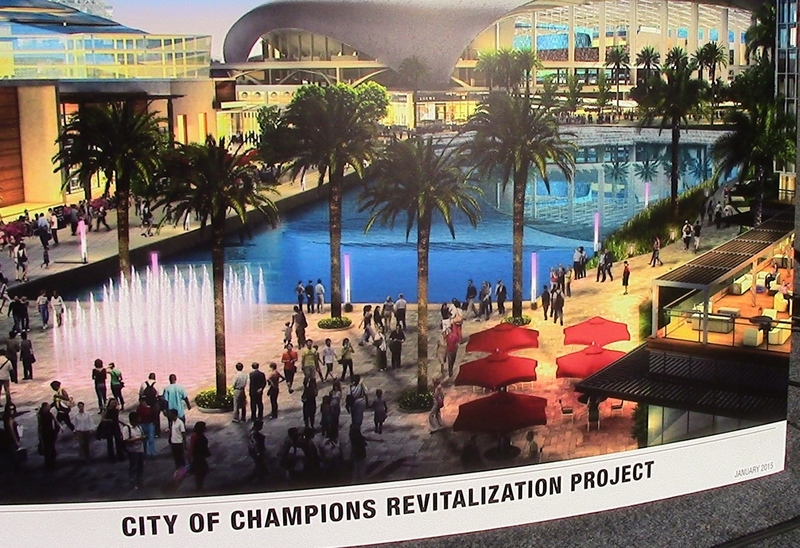 Kroenke is buiding his NFL stadium in Inglewood as part of the City of Champions Revitalization Project. Estimates are an owner looking to relocate his team to L.A. will have to fork up a fee of half-a-billion to a billion dollars. Were that to actually happen, that cost would be passed down to the L.A. football fan paying outrageous prices for personal seat licenses; a voucher to get you a ticket inside the stadium. Then there’s parking, the actual ticket to the game as well as concessions for food and drinks that would undoubtedly be astronomical all because of this relocation fee. A team owner willing to move his team to Los Angeles and the fans that have waited a generation to be able to attend an NFL game in their home city SHOULD NOT be subjected to a hefty relocation fee. The 32 owners have made multi-billions of dollars using L.A. as leverage and will make a great deal more once a franchise or two calls Los Angeles home. That’s WITHOUT so-called relocation fees. Making an owner pay a billion dollar relocation fee to L.A. pales in comparison to the multi-billions of dollars Los Angeles has netted the league over the past two decades as a leverage piece. According to Forbes franchise values have quadrupled in the last 17 years when most of the 22 stadiums were built. The Dallas Cowboys top the list at $3.2 billion with the newly crowned Super Bowl Champion New England Patriots coming in second valued at $2.6 billion. Both play in two of the 22 stadiums built since L.A. has been without a team. Patriots’ owner Robert Kraft purchased the team for $175 million in 1994 which is, coincidently, the last year Los Angeles was home to the Rams and Raiders. Kraft’s franchise is now worth some 15 times his initial investment. Thanks partly to the leverage game L.A. was forced to play. On the field, L.A. has a rich NFL history with the Rams who called L.A. home for 49 years. They played 34 of them in “L.A. proper” at the Memorial Coliseum and the last 15 in Anaheim sharing the “Big A” with the baseball Angels. The Raiders left their birthplace in Oakland calling the Coliseum home for 13 years before returning to the East Bay after the 1994 season. The Chargers inaugural season in 1960 was spent in L.A. before bolting south for San Diego where they’ve called home for over 50 years. Since ‘95, if an NFL fan in Los Angeles wanted to see the likes of Tom Brady, Peyton Manning and Aaron Rodgers among others in person, a two-hour and more than 125 mile drive to San Diego, or a five-hour 370 mile drive to Phoenix or an eight-hour drive or $200 roundtrip flight to the Bay Area have been the best options for L.A. fans to see these talents in person. That’s how L.A. used as leverage has affected the L.A. football fan. Los Angeles has made multi-billions of dollars for all 32 NFL owners off the field and has a rich NFL past on it. Waiving any type of relocation fee to L.A. would be a reward for its football fans who have gone an entire generation without a team to call their own.